Prior to joining Disney in 2017, Vida Cornelious was EVP and CCO of Walton Isaacson. Before Walton Isaacon, Vida led the total market evolution of agency GlobalHue where her creative achievements included two acclaimed Super Bowl spots: Jeep’s 2014 “Whole Again” featuring Oprah Winfrey and Chrysler’s 2015 “America’s Import” featuring Bob Dylan. Both landed top slots on the USAToday Ad Meter poll and each garnered over 15 million YouTube views. During her tenure with GlobalHue, she also led creative responsibilities and added new business wins for client partners Coca-Cola, Walmart and US Bank. Prior to GlobalHue, Vida was VP, Creative Director at DDB Chicago, where she generated award-winning creative and worked on accounts including McDonald’s, Dell Computers, JCPenny, State Farm, Qwest, and Budweiser. Over her 20-year career, Vida’s work has been recognized by the Cannes International Advertising Festival, Chicago Creative Club, London International Awards, Effie’s, Summit International Awards, Addy’s, Communication Arts, Graphis and Luerzer’s Archive. She has garnered accolades for her creativity as well as for generating marketing results. As a result her creative work and career have been featured in noted media outlets, including: Time Magazine, Advertising Age, Adweek, Shoot, The Wall St. Journal, Diversity in Business, Black Enterprise and Essence Magazine. Vida firmly believes in fostering the success of women in the male-dominated ranks of advertising creative departments by making time to mentor aspiring female creatives. 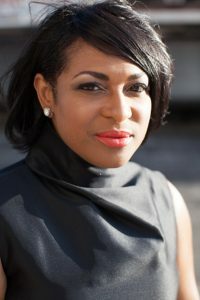 She was honored as one of Ad Age’s “40 Women to Watch in Advertising,” ranked as one of the “Top Women in Advertising and Marketing” by Black Enterprise and was an ADCOLOR “Change Agent” award winner. She was also featured in the book “My First Time,” celebrating the personal stories of top advertising female creative talent. In addition to being an award show juror for the International ANDYs, National Addy’s, Effies, AICP and The Art Directors Club, she has been a panelist and speaker for the AAF, the MAIP Program, the 3% Conference, as well as a guest lecturer on Multicultural Marketing at Georgetown University, Duke University, University of Illinois and Ohio University.